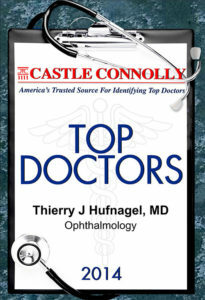 Dr. Hufnagel is a cornea-trained, board-certified ophthalmologist. He is a graduate of UCLA, Yale and Johns Hopkins Universities. Dr. Hufnagel has been recognized as a VISX STAR, an award granted only to the leading excimer laser surgeons in the United States. Dr. Hufnagel has participated in an FDA-sponsored investigation for LASIK surgery. His pioneering involvement with excimer lasers dates back to 1987 with published studies on the pathological aspects of laser surgery applied to the cornea. To date, he has performed several thousand laser vision correction procedures and tailors all surgeries to each patient’s individual needs. He is an instructor in IntraLASE™ bladeless LASIK surgical technique and actively teaches LASIK to other surgeons. After getting to know Dr. Marc Werner, we thought you might want to meet Dr. Thierry Hufnagel. If you still have questions for Dr. Hufnagel, like his opinions on the iFS laser or what his Ben and Jerry’s ice cream flavor would be, let us know in the comments below. What is your favorite memory from your years at Johns Hopkins? My fondest memory about Hopkins? People were referred there from all over the world for advice and treatment. I once examined this very famous Chicago lawyer who came in for cataract surgery. He was referred to me by my mentor, Dr. Walter Stark. After the lawyer came in for surgery, I told Dr. Stark that I thought he shouldn’t operate on the patient. I didn’t think that patient had a cataract! After further testing, we found that the patient’s visual loss was actually from a brain tumor, not a cataract. From that day on, they all thought I was pretty smart…very funny! How many years have you been practicing laser surgery? I opened my first LASIK center in New York City at the Trump Tower in 1995 called Insight Vision. What made you pick ophthalmology, particularly LASIK, as a specialty? When you ask patients about LASIK, most of them will tell you it’s the best thing they ever did! Not getting married, not having children, but having LASIK done! Lots of people see their need for glasses or contacts as a serious disability. Providing people with the gift of sight is very rewarding. My first rotation in medical school was in a hospice with end-of-life cancer patients. I couldn’t do anything to help except pushing the morphine. I felt pretty useless. I looked for the field where I thought I could be the most helpful. Obstetrics and bringing babies to life or ophthalmology and providing the gift of sight were the two options I looked into. Then by chance, I landed in the eye business, not the maternity ward! Where do you teach LASIK to other surgeons? We do all of the teaching in our office where we have a state-of-the-art facility. Your favorite thing about New York?